Amplify were approached by Sonos to create a brand awareness experience to support their ‘You’re Better Than This’ media campaign. The campaign focussed on the absurdities of modern listening and recognised common 'audio fails', ranging from old speakers with a mess of tangled cables to phones placed in mugs. To embrace the campaign spirit, working with Amplify, we devised the Sonos #ListenBetter Amnesty – a way for people to swap the poor quality of their old speakers and audio fails for the rich sound of a Sonos PLAY:1 wireless speaker. 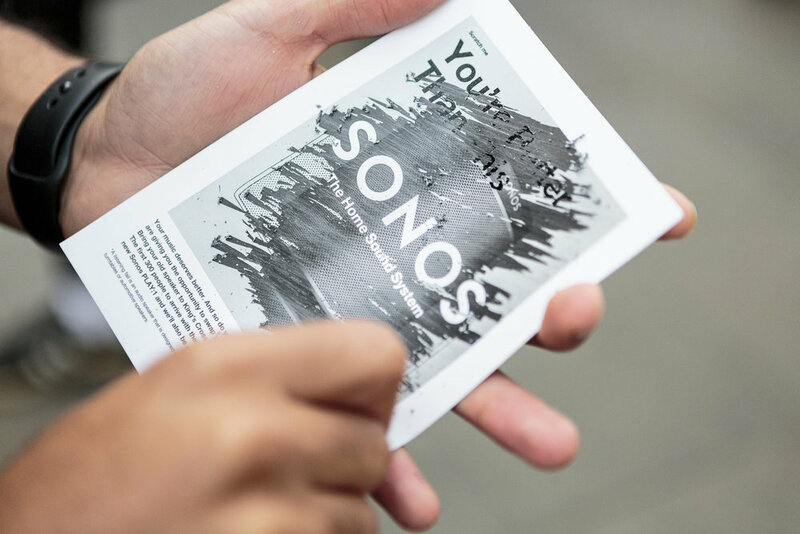 We promoted the activity through scratchcard flyers, where commuters were encouraged to literally scratch away their listening fails to reveal an image of the Sonos PLAY:1. Participants queued at a bespoke stand at London's King's Cross Station from 5am, with the first 300 leaving with a brand new Sonos PLAY:1 speaker. As the old audio fails were donated over the course of the day, they were repurposed and used to create a large-scale installation on site by production company Made. Each old speaker was sprayed black and constructed into a towering monolith of audio past, showing everyone who walked past: 'You're Better Than This'.